THE ESTATE AGENT The estate agent is an intermediary intervening in the operations of purchase, of sale, exchange, sublease or renting of houses, flats, business, fields. He represents one of the parts to the operation which can be the purchaser, the seller, the owner or the tenant. Alone the holder of identity card issued by the prefecture is authorised to go about things in this transactions. The law of January 2nd, 1970, changed by prescription n ° 2004-634 of the July 1st On 2004 relating to intervention and to management of buildings and business and by the decree n ° 2005-1315 of October 21st, 2005, specifies news conditions of exercise of this profession. Attention: the already issued identity cards remain valid until them expiry date. I. CONDITION OF EXERCISE OF PROFESSION: THE COMPULSORY GETTING OF A CARD PROFESSIONAL The deliverance of the identity card changes. 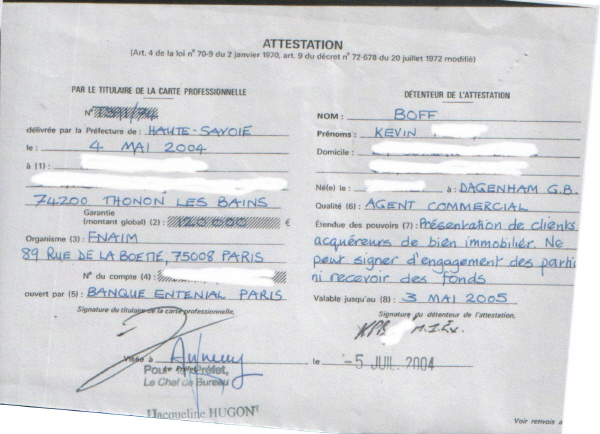 Since January 1st, 2006, there is three identity cards: «transactions on buildings and fund of trade ", " property management "and " trader of lists». Mention particular relating to tourist benefits and to service benefits (concerning only the persons not established in France) will be possible be specified on the card. This one is valid 10 years. Any modification must be brought back to the prefecture which issued the card. Point out: the law n ° 2006-872 of July 13th, 2006 (said law " ENL ") envisages that the persons physical appearances and the statuary and lawful representatives of a legal entity holders of an identity card issued at the latest on December 31st, 2005 is reputed justified of professional aptitude as from January 1st 2006. A. Deliverance of the identity card to a person physical appearance To get the identity card, the applicant individual owes fulfil following conditions: - In certificate or professional aptitude: the future agent real estate must be tenured is of a certificate of level receptacle +3 in domains of legal, economic or commercial studies, that is of one university degrees of technology or one LOW VOLTAGES in the property sector, let be of the certificate of economic and legal studies applied in building and in the house, option sale and management of building. Failing the detention of these certificates, the future professional will be able to give proof of one experience professionals is of at least three years if he has baccalaureate or an equivalent certificate, is of at least ten years if it has none of these certificates (reduced in four years if it is about a job of frame). Job can be in complete or partial time, over period or not uninterrupted; - give proof of his registry office, his domicile and his profession; - give proof of a sufficient financial guarantee allowing refund of fund, effects or stocks kept by the agent. This guarantee must result from one given written commitment is by a firm of insurance especially recognised, is by a credit institution or by any allowed establishment to perform operations of bank in the sense of the article L. 518-1 of Code monetary and financial. The sum of guarantee must be at least 110 000 euro. This minimal guarantee is however fixed to 30 000 euro for first two years of exercise. For more information, contact your prefecture. Financial guarantee covers from now on any having credence for origin a remittance or a delivery performed on the occasion of one property operation (article 1 of the law of January 2nd, 1970). The guarantor not is more possible demand of the creditor that he acts prior to aims of levy; - sign an insurance of professional civil liability (RCP); - not have made the object of a criminal condemnation by a jurisdiction French or foreign for one of the following offences: crime, trouble of in less three months of imprisonment without respite for fraud, abuse of confidence, concealment, laundering, active or passive corruption, influence peddling, subtraction and misappropriation of property, forgery and falsification of titles and of fiduciary stocks issued by the public authority, falsification of marks of the authority, participation in a criminal conspiracy, traffic of drugs, procuring, bankruptcy, usurious loan, offences of legislation on raffles, circles, casinos, in legislation on financial relations with the foreigner, tax fraud, offence of the Code of the building and of the house, official discharge public or ministerial; - do not make the object of one of the following inability: pronouncement of a measure of personal bankruptcy, a radiation of functions of administrator or of judicial deputy, of a ban to practise at least during six months a liberal profession. Every person who incurs an inability must stop the function of agent real estate in the month which follows when inability became final and has notified. This delay can however be reduced or abolished by the judge (to see paragraph relating to sanctions below). B. Deliverance of the card to a legal entity The legal entity cannot see herself issuing agent's identity card real estate that if his statuary and lawful representatives met in above-mentioned conditions applicable to the individuals. This representatives owe, besides, give proof, during the request of the card professional, of name, in legal form, head office and of the object of the legal entity by the presentation of an extract of the register of trade. A prior statement of activity must be signed in the prefecture of department where is located every establishment, agency, branch or office by the person who assures direction. II. CONDITIONS OF EXERCISE OF PROFESSION A. Obligation of a written mandate The estate agent can undertake transaction only if he is provided with one mandate written whose original will be delayed to the client. In defect, the estate agent not is possible receive remuneration, whatever is its nature. Convention so crossed is necessary specify: - the characteristics of the property good searched by the client; - the nature of the benefit promised to the client; - the sum of remuneration. Point out: law ENL envisages that, subject to envisaging it by contract, the agent real estate can ask the one who delegates it as part of his activities professionals all or part amounts of money (freshly, committees), and it even before operation is concluded and determined. Application of this disposition is subjected in al publication of a decree in Council of State. B. Keeping of registers The estate agent must hold a register directory (allowing to record financial movements) and a register of mandates. These registers can be held and retained in electronic form. C. Payment Payments by bank card are accepted. D. Hypotheses of withdrawal of the card of estate agent The holder of the card is in the obligation to restore it to services of prefecture or to an agent of the public authority in case of: - suspension of financial guarantee; - suspension, expiration or denunciation of the contract of insurance RCP; - ban or inability to practise. E. Criminal sanctions 1. 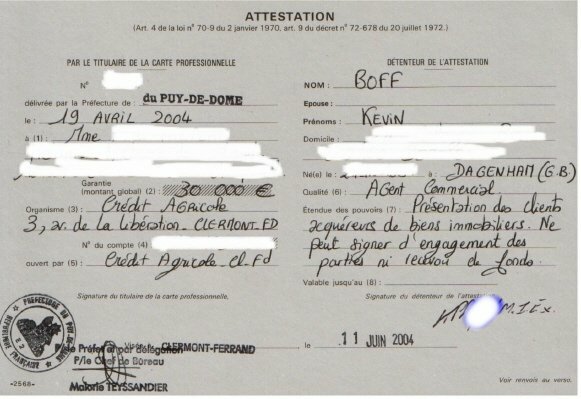 Fact is punished of six months of imprisonment and of 7 500 euro of fine: - to devote itself or to help out, in a habitual way or occasional, in property operations without being holder of the card of estate agent; - not to perform the prior statement of activity of a branch, of one agency or of an office; - to negotiate, to mediate or to make commitments on behalf of of a holder of an identity card without being authorised there. 2. Fact is punished of two years of imprisonment and of 30 000 euro of fine: - to accept or to keep amounts of money, property, effects at occasion property operations in offence with applicable legislation. The legal entities can be also searched pénalement for these offences and to incur notably troubles of fine, of dissolution or of ban to exercise contentious activity. 3. Fact is punished of five years of imprisonment and of 375 000 euro of fine: - to exercise this property activity in violation of aforementioned inability (inability to exercise profession). Агент по продаже недвижимости агента по продаже недвижимости является посредником вмешательство в операции покупки, продажи, обмена, аренды или субаренды, домов, квартир, бизнес, поля. Он представляет собой одну из частей в операции, которая может быть покупателем, продавцом, владельцем или арендатором. Один держатель удостоверение личности, выданное префектурой имеет право идти о вещах в этой операции. Закон от 2 января 1970 года изменился в соответствии с предписанием N ° 2004-634 от июля 1-го по 2004 года, связанные с вмешательством и эксплуатации зданий и бизнес, и Указ № 2005-1315 от 21 октября 2005 года, указывает пресс условиях осуществления этой профессии. Внимание: уже выданные удостоверения действительны до их истечения срока годности. I. СОСТОЯНИЕ ОСУЩЕСТВЛЕНИЯ ПРОФЕССИЯ: ОБЯЗАТЕЛЬНОЕ ПОЛУЧЕНИЕ КАРТЫ PROFESSIONAL избавление изменения удостоверения личности. С 1 января 2006 года, есть три удостоверения личности: «сделок на здания и фонд торговли", "управление недвижимостью" и "Трейдер списков». Упоминание частности, связанных с туристической преимуществ и пособий (в отношении только лица не установлены во Франции), можно будет быть указан на карте. Этот действительно 10 лет. Любые изменения должны быть возвращены в префектуру, которая выдала карту. Обратите внимание: закон N ° 2006-872 от 13 июля 2006 (указанного закона "Эксон Нефтегаз Лимитед") предусматривает, что лица, внешности и скульптуры и законными представителями юридического лица из владельцев удостоверения личности, выданного не позднее 31 декабря 2005 года, как считают оправданным профессиональной пригодности, как с 1 января 2006 года. А. Избавление удостоверение личности лица внешности Чтобы получить удостоверение личности, индивидуальный заявитель обязан выполнить следующие условия: - В сертификате или профессиональной пригодности: будущий агент недвижимости должен быть штатным имеет сертификат уровня сосуд +3 в области правовых, экономических и коммерческих исследований, что является одной степени технологического университета или одного низкого напряжения в секторе недвижимости, пусть свидетельства экономических и правовых исследований, применяемых в строительстве и в доме, продажа и опции управления здания. В противном случае задержания этих сертификатов, будущий профессионал сможет дать доказательство одного профессионалов опыт не менее трех лет, если он имеет степень бакалавра или эквивалентный сертификат, имеет по крайней мере десять лет, если он не имеет ни одного из этих сертификатов (снижение в течение четырех лет, если речь идет о работе в кадре). Работа может быть в полной или частичной времени, в течение периода или не непрерывно, - дать доказательство его загс, его жилища и его профессии, - дать доказательства достаточные финансовые гарантии возврата позволяет фонда, эффекты или запасы хранятся агентом. Эта гарантия должна привести с одной письменное обязательство фирмой страховых особенно признается, является кредитной организацией или любым разрешено создание для выполнения операций банка в смысле статьи L. 518-1 Кодекса денежно-кредитной и финансовой. Сумма гарантии должна быть не менее 110 000 евро. Это минимальные гарантии, однако, фиксируется на 30 000 евро за первые два года осуществления. Для получения дополнительной информации обратитесь к префектуре. Финансовая гарантия покрывает отныне любой имеющий веру в происхождении перевода или поставка осуществляется в связи с одним свойством работы (статьи 1 закона от 2 января 1970 года). Гарант не более возможно требование кредитора, что он действует до цели сбора, - подписать страхование профессиональной гражданско-правовой ответственности (RCP), - не сделали объектом уголовного осуждения юрисдикцию французского или иностранного одного из в отношении следующих преступлений: преступления, беда менее трех месяцев лишения свободы без передышки за мошенничество, злоупотребление доверием, сокрытие денег, активной или пассивной коррупции, влияния торгуют, вычитание и незаконном присвоении собственности, подделке и фальсификации заголовков и доверительного акции выданный государственным органом, фальсификация марок полномочий, участие в преступном сговоре, оборотом наркотических средств, закупки, банкротство, ростовщический кредит, правонарушений законодательства о розыгрышах, кружки, казино, в законодательстве о финансовых отношениях с иностранцем, налоговой мошенничество, нарушение Кодекса здания и дома, официальных государственных разряда или министров, - не делают объект одним из следующих неспособность: заявление меры личного банкротства, излучение функции администратора или судебного депутат, запрета заниматься по крайней мере в течение шести месяцев свободной профессии. Каждый человек, который берет на себя неспособности должны прекратить функции агента недвижимости в месяц, который следует при невозможности стало окончательным и уведомил. Эта задержка, однако, может быть уменьшен или отменен судьей (чтобы пункт о санкциях ниже). Б. Освобождение платы юридическому лицу юридического лица не может видеть себя выдачи удостоверений агентов карта недвижимости, что если его скульптуры и законные представители встретились в вышеуказанные условия, применимые к лицам. Это представители должны, кроме того, предоставить доказательства, в просьбе карты профессиональные, имени, в судебном порядке, головной офис и объектов юридического лица путем представления выписки из реестра торговли. До заявления деятельности должно быть подписано в префектуре департамента, где находится каждый создания агентства, отделения или должности человека, который обеспечивает направление. II. Условия осуществления ПРОФЕССИЯ А. Обязанность письменное поручение агент по продаже недвижимости могут проводить сделки только если он имеет один мандат письменного чья первоначальная будет отложено на клиента. В дефект, агент по продаже недвижимости не возможно получать вознаграждение, независимо от его природа. Конвенции, с тем перешли необходимо указать: - характеристики имущества хороший поиск клиента, - природа в пользу обещал клиенту; - сумма вознаграждения. Обратите внимание: закон предусматривает, что Эксон Нефтегаз Лимитед, с учетом предусматривает его контракт, агент недвижимости может спросить, кто делегатов это как часть своей деятельности специалисты всех или части суммы денег (недавно, комитетов), и еще до операции заключены и определяется. Применение этого расположения, подвергается в аль публикации указа в Государственном совете. B. Ведение регистров агент по недвижимости должен иметь каталог реестр (позволяет записывать движения финансовых) и реестр мандатов. Эти регистры могут быть проведены и сохранить в электронном виде. C. Оплата платежей по банковским картам принимаются. Д. Гипотезы о выходе из карты агент по продаже недвижимости держателю карты в обязанность восстановить его услуг префектуры или агентом государственной власти в случае: - приостановление действия финансовых гарантий; - подвески, истечения срока действия или Денонсация договора страхования РКП, - запрет или невозможность на практике. Е. уголовные санкции 1. Факт наказывается шести месяцам тюремного заключения и 7 500 евро штрафа: - посвятить себя или помочь в привычный образ или случайно, в собственности операций без держателя карты агент по продаже недвижимости, - не выполнять до заявления деятельности филиала, одного учреждения или офиса; - вести переговоры, посредником или принимать обязательства от имени обладателя документа, удостоверяющего личность, не будучи уполномоченным там. 2. Факт наказывается до двух лет лишения свободы и 30 000 евро штрафа: - принять или сохранить суммы денег, имущества, эффекты в случае имущество операций в преступлении с действующим законодательством. Юридические лица могут быть также искали pénalement за эти преступления и нести в частности проблемы штрафа, роспуска или запрета на осуществление деятельности спорным. 3. Факт наказывается пяти годам тюремного заключения и 375 000 евро штрафа: - на осуществление этой деятельности имущество в нарушение вышеупомянутых неспособность (невозможность осуществлять профессии).